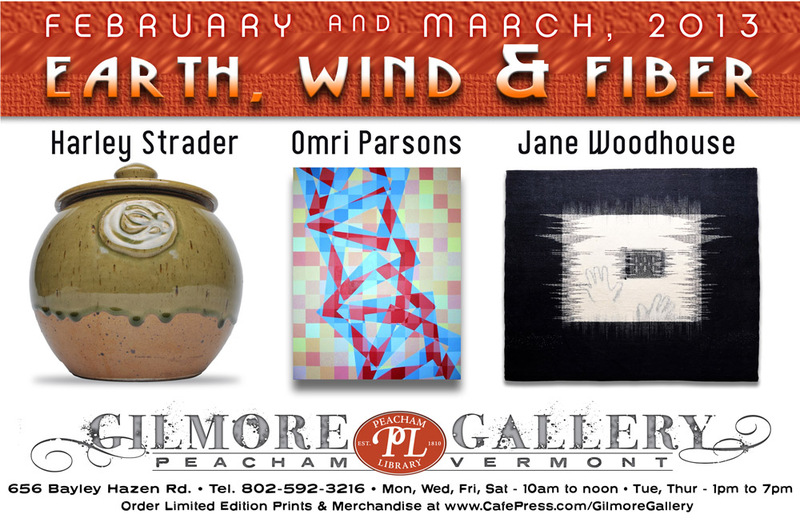 The Gilmore Gallery at Peacham Library is proud to present the work of local art stalwarts Harley Strader (pottery), Omri Parsons (painting) and Jane Woodhouse (textiles) for February and March. All three of these Peacham residents have been active in the local arts community for many years, and all three are contributing to the Peacham Elementary School this year as artists in residence – exposing Peacham’s budding young artists to the artistic process in a wide variety of media. An artists’ reception was held on Sunday, February 17th. Purchase limited edition prints and merchandise to support the library via the Gallery’s blog.